A symbol of modern mobility-the car- with video game and movie franchises dedicated to the mechanism, is pop culture’s mascot. Artists, like John Baeder in the below work, depicting older car makes expound upon their cachet to evoke nostalgia for suburban America. As a subject, one sees the symbol of the car transformed in artwork. Once the epitome of freedom, cars incite the mundaneness of city commute. Z.Z. 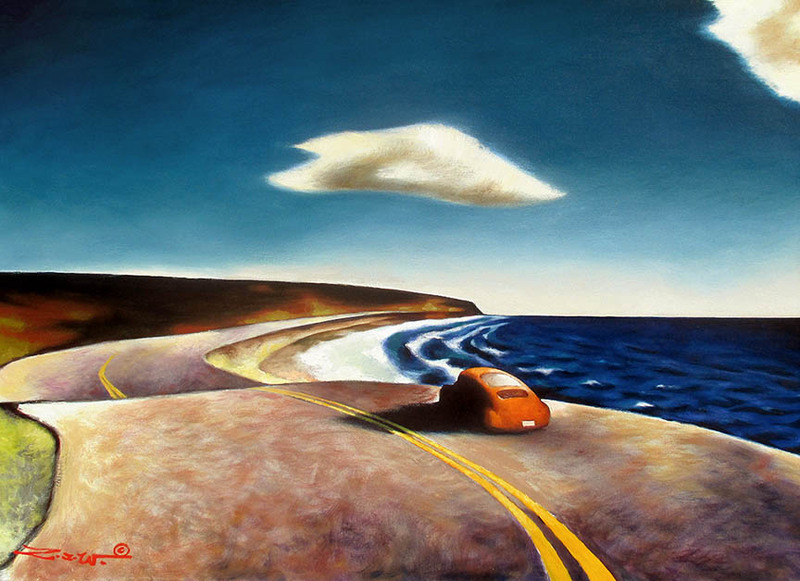 Wei, Coast Highway, Oil on canvas, William A. Karges Fine Art. Click to inquire. A symbol of modern mobility-the car- with video game and movie franchises dedicated to the mechanism, is pop culture’s mascot. 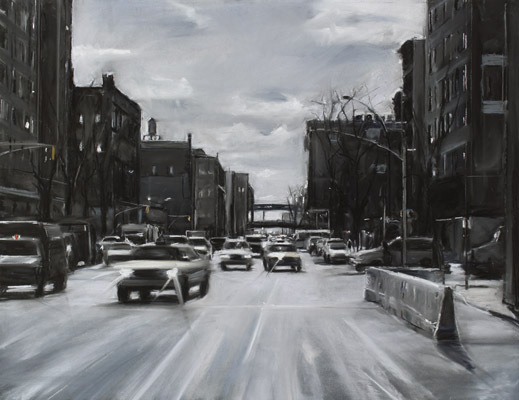 Artists, like John Baeder in the below work, depicting older car makes expound upon their cachet to evoke nostalgia for suburban America. As a subject, one sees the symbol of the car transformed in artwork. Once the epitome of freedom, cars now incite the mundaneness of city commute. 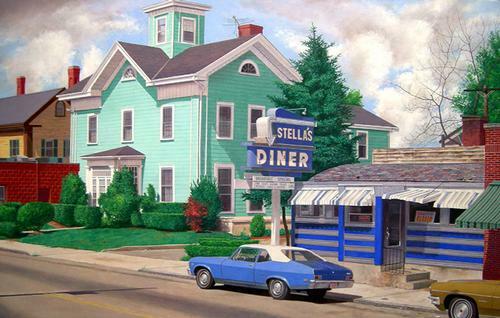 John Baeder, Stella's Diner, Oil on canvas, Jonathan Novak Contemporary Art. Click to inquire. 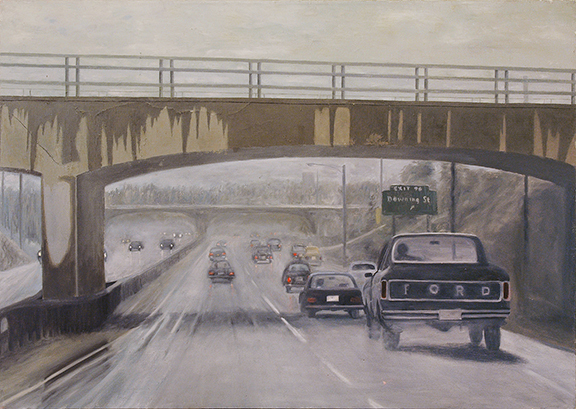 Edward S. Goldman, Underpass, Acrylic on canvas, David Cook Fine Art. Click to inquire. FADA’s inventory explores these juxtapositions. Saul Steinberg, “Manhattan City Street,” from “The Passport,” Ink and watercolor on paper, Denenberg Fine Arts. Click to inquire. 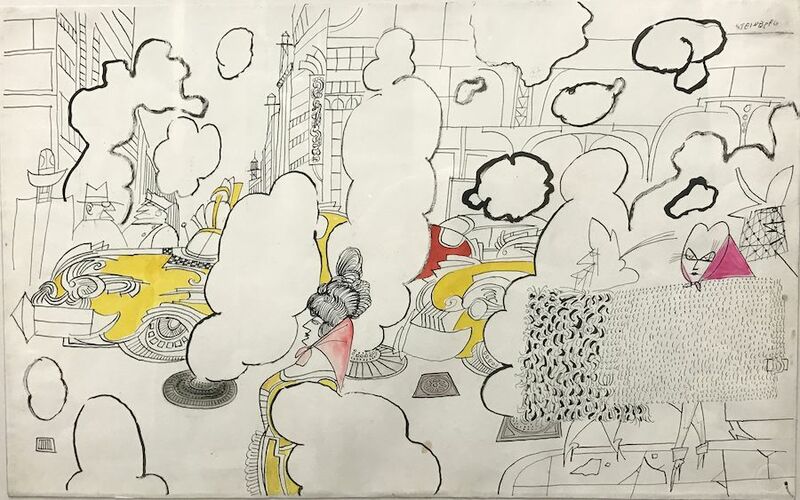 Saul Steinberg’s “Manhattan City Street,” from “The Passport,” an ink and watercolor on paper from FADA Member Denenberg Fine Arts, indicates its post-war date through its fanciful rendering of a NYC streetscape, replete with its iconic taxis. Setting the city in motion, it personifies the thrill (and frill) of city life. Susan Grossman, Barrier, Charcoal and pastel on paper, Jerald Melberg Gallery. Click to inquire. Laurie Lipton’s Round and Round (Below), a lithograph from FADA Member Bert Green Fine Arts, capitalizes on the notion of a car’s unhindered motion and borrows from Steinberg’s cartoonish imagery. 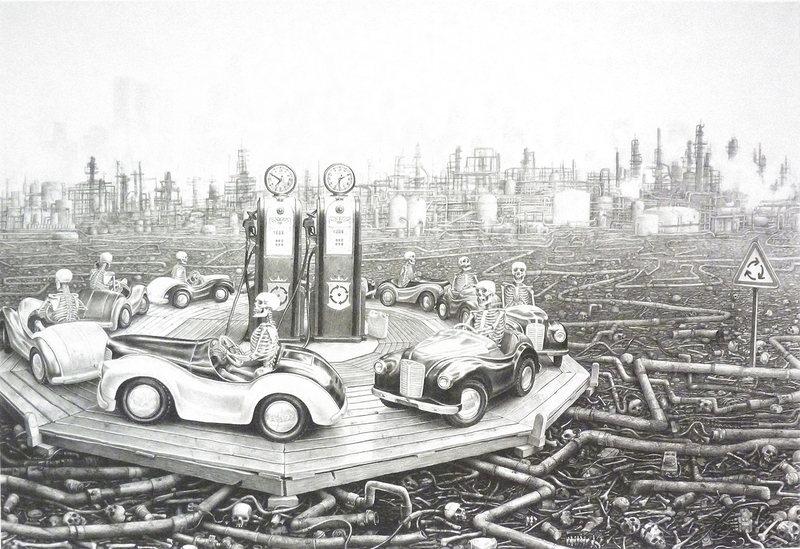 However, driven by skeletons, cars in the lithograph highlight contemporary anxieties over pollution. Laurie Lipton, Round and Round, Lithograph, Bert Green Fine Art. Click to inquire. Are cars loosing their romance- the thrill of driving lost upon a generation of ride sharing vehicles on the precipice of being driver-less (an art installation idea)? How will the next evolution of cars as subjects materialize?